"Occult" just means "hidden" and so in itself, it is a neutral word. It is neither good nor evil. The outcome of any occult act lies in the intention of the performer of it. But as many are increasingly becoming aware, there has been a silent and subterranean occult war going on for some time across the world between various Freemasonic groups. While we’re watching surface events, others are working the geometries, archetypes, leyline energies and numbers underneath that which appears to be happening on the surface, and these underground factors engage a part of our brain of which we’re largely unconscious, which is why it’s called the unconscious mind. However, like the seven-eighths of the iceberg which lies under the water, our unconscious minds are more powerful than our conscious minds (the eighth of the iceberg above the water) in dictating the direction of our lives. It’s my belief that the main aim of all the psy-ops campaigns in recent months, about false flag attacks and possible ET invasions or Disclosure at the Olympics, has been to get us all to watch. They can’t programme our unconscious minds if we don’t watch what they put on our screens. So they needed us to be present and engaged ~ and I would say they’ve succeeded massively in drawing most of us in to be a part of their occult offering to the gods. 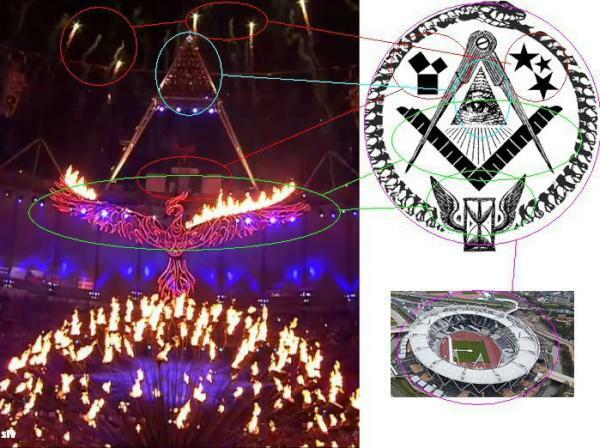 Why do I believe that the London Olympic Games 2012 was an occult ritualistic ceremony to the gods? Well, partly because it always was. As Mike Williams wrote in his article How the Olympic Games Began as a Religious Ceremony, when the Olympics began, back in history, it was nothing to do with sport. The original Olympics were purely a ceremonial ritual dedicated to the gods of Olympus, and that hasn’t changed. The sporting bit of the Olympics was adopted much later on, and even today, it’s only an excuse, to add to the enchantment of the masses. The Games themselves are just a veneer to hide the real Zionist Game and that is to perform a magical ritual which is carried out by the use of certain symbols, numbers and geometrical shapes and various other forms of alchemy which programs the unconscious minds of those watching and engaging. There was a lot of occult, alchemical symbology on display in the opening ceremony, and there are articles covering that in the Further Reading section below. But the main implant took place when the five rings became enflamed. 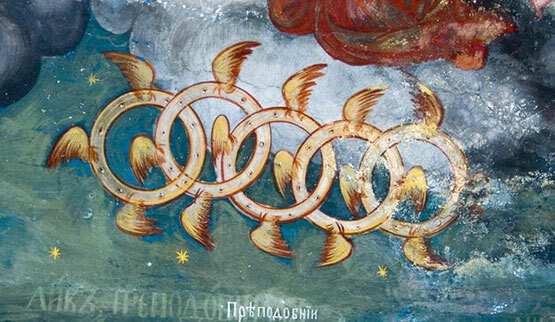 This was to represent the spinning flaming wheels of the Old Testament prophet Elijah’s chariot as he ascended to Heaven. 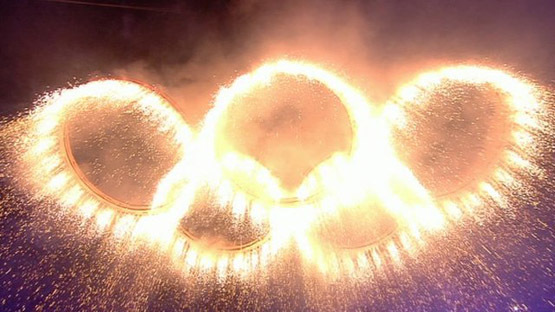 As the Game was broadcast all over the world, the programming continued with the original implant of the opening ceremony being constantly reinforced by the regular flashing up on our screens of the five rings, and Vangelis’s Chariots of Fire playing in the background. The athletes are awarded miniature versions of these wheels in the form of medals, the unconscious implication being that winning the Olympics will get than an audience with the gods of Olympus, just like Elijah. But then like all occult ceremonies which have to be closed down when the aim has been achieved, we had last night’s closing ritual. "If the opening ceremony was the wedding, tonight will be the ’disco after the marriage.’"
Whether Gavin realised it or not, this was an allusion to the Divine Marriage, or Alchemical Marriage, a rite once practised by Rosicrucians and nowadays by Freemasons, and based on the text The Chymical Wedding of Christian Rosenkreutz. The Divine Wedding is a metaphor for the most important stage in an alchemical process, known as a conjunction, which is a conjoining (or joining) of two substances to form a new substance with its own characteristics. This new substance is known as the Child of the Conjunction, or the Philosopher’s Stone. The Philosopher’s Stone is said to turn base metal into gold, and to offer the boon of immortality. And so now that the aim of the creating the Philosopher’s Stone had been achieved, the ceremony needed to be closed down with thanks, gratitude and celebration. It was an amazing show ~ as you would expect from something designed to fully engage the audience ~ and there were some brilliant performances (my favourites were Russell Brand as The Egg Man and Annie Lennox ). It was wonderful to see people having such a great time, especially the athletes and volunteers who deserved a great party after all their hard work. However, underlying the show and the party, and unbeknown to most of those taking part, it was a Freemasonic closing ritual. At the beginning, the struts of the London Eye which provided the backdrop for most of the activities of the first hour were set in the position of the saltire cross of the Scottish Rite of Freemasons. I’ve written extensively elsewhere about the deeper meaning and history of the saltire cross, but in a nutshell for now, it is about death and resurrection. One of the highights featured a stepped pyramid created out of 303 white boxes to Kate Bush’s Running Up That Hill, and when the song got to, "If I could make a deal with God" all the dancers were in full prostration on the floor. In numerology, the O counts for zero, so in other words, the white boxes making up the pyramid represented the number 33, the most significant number for any Freemasonic ritual and the highest order that can be achieved. The classic masonic black-and-white chequered floor was flashed up, dozens of times, on the screen behind one of the performing bands, as a background to an Olympic medal in the foreground. And then, at the end, the ultimate Freemasonic symbol of all, the phoenix rising from the ashes, to the sung words of "...we can rule the world" by Take That and the backdrop turning into the image of the famous masonic compasses and ruler. In any occult closing ritual, the last action performed is the dowsing of the flame of the candle. In this case, it was the putting out of the torch or cauldron. This article is being discussed here on Ishtar Babilu Dingir’s forum, Ishtar’s Gate. If I may be allowed, I'd like to add about a 100 of these, but only one (1) for now. Let me know if I should make the other 99 for the enlightenment of the Sheeple of the World. Thank you Honeygril.. Now I am enlighted too. John Lennon lying dead, wow, But after all he is one of the lucky ones. Being already dead I mean. Can we stand to see more of the occult from the closing videos that was broadcast to the world. And pray tell me just what this monstrosity was supposed to represent? DTOM, Thank you, I was about to copy and paste the message that, (may I name him here)?, Ishtar Babilu Dingir, who wrote a very interesting analizes of the closing. I did copy the photos for my archives and will use them when the time comes. Copy of a part of great interest and truth but not all there is to know..
May I add that he, Ishtar Babilu Dingir, did not, or may not know all or that much about,,,, what the organizers plan to do with the copper kettles, or pettles, or thorns, whatever that were used in the flame, after the closing. I have it on good authority that they will all be taken back to all of the 204 countries of the participents somehow and used to..... Its to horrorable to state here so I will just ask you to pray that Larry and his source is dead wrong in his prodictions... here is more for you to ponder..... This may be one of the milder bits of Prodictive Programing of the masses used during the closing of the 2012 London Olympics. Perhaps it is in fact meaningless to speculate about it. There was a lot more Occult imageing used last night to get us ready for the Damnable ONE WORLD GOVERNMENT. John Lennon lying dead ephigy illuminati sacrifice and his new-age NWO theme song playing .. it just made me sick to watch I had to make myself watch it .